As your cat ages, you may begin to notice behavioral changes and this can raise concerns. Many people wonder if cats can get something similar to Alzheimer’s disease. The reality is that senior cats can develop dementia, and it is called cognitive dysfunction syndrome. It is not uncommon for cats to begin showing signs of decreased cognitive function in their golden years. Many cats tend to exhibit particular signs, though they will be a little different for every cat. You know your cat best and will likely notice changes in his behavior due to memory loss, disorientation, or other things that can lead to confusion. In cats over 15 years old this condition is very common and the manifestation thereof comprises of a variety of symptoms ranging from joint problems to hearing problems. Senior dementia in cats is serious condition that reduces the cat’s quality of life, so it is important that you remain vigilant in understanding this disorder so you can help improve your pet’s life. The most important thing is to not discount behavioral changes as nothing more than old age. Many of these behaviors are also signs of illness and medical issues. It is best to schedule a vet visit to rule out those possibilities. Every cat has a certain level of “talkativeness.” Some are always quiet and purring while others meow about everything. The change seen with senior dementia is one of increased or excessive vocalizations and not just a simple meow. Cats experiencing this may appear to be confused and not totally sure of their surroundings while vocalizing. This behavior is more common at night and can often wake up the household. It is important to remember other possible causes of new or odd vocalizations. These include pain due to arthritis or injury or, in some cases, changes related to hyperthyroidism. The confusion that comes along with senior dementia may lead some cats to “forget” their years of proper litter box behavior. Cats are fastidious, especially about their toilet manners, so a cat who goes outside the box all of a sudden is a cause for concern. Inappropriate urination or defecation can be symptoms of many diseases. This is one you should definitely not brush off as just a sign of senility. Schedule an appointment with the vet so an infection or impaction (constipation) can be ruled out before doing anything else. Cats love to keep themselves clean and looking good. If your feline friend begins to neglect this essential task, it’s a sign that something’s not quite right. Like most changes in behavior, a lack of grooming may be a sign of many diseases, in addition to simply not feeling well. It’s common for senile cats to no longer care about keeping their coat in good condition. If your cat is overweight, that may contribute to the problem as well because it may be too difficult to reach everywhere. Cats are naturally nocturnal, as many of us find out with the occasional 2 a.m. wake up meows. Yet, you might notice that your cat begins to appear more anxious at night in her later years. It’s not uncommon for senile cats to become disoriented when everyone else goes to bed. This can lead to separation anxiety. She might even confuse day and night, spending days sleeping peacefully and the night hours stressed out or vocalizing. Cats sleep a lot! It’s what they do and how they spend the majority of their days and nights. This behavior in older cats is going to depend a lot on your personal observations. 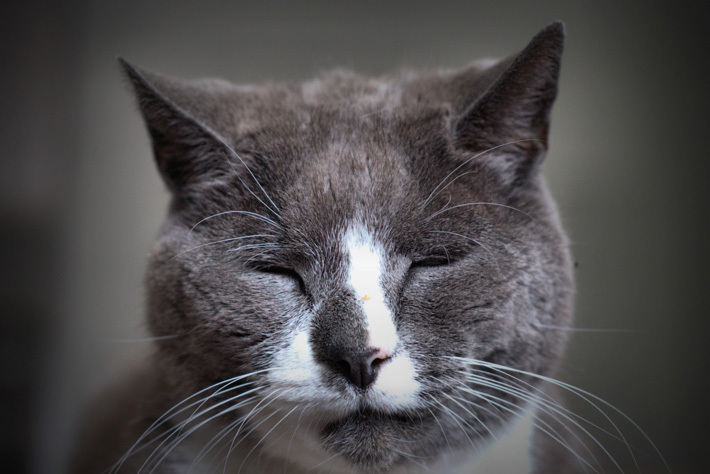 If your cat is sleeping longer than normal, this change may be due to cognitive decline. For instance, he may not wake up for his scheduled dinner time or fail to greet you at the door after work. Instead, you may find that he remains sound asleep in his favorite spot. Cats can be a little temperamental at times. They will either put up with you or not and it will typically be on their terms, so this is another change in your cat’s particular behavior. You may begin to notice that your cat doesn’t respond as you have come to expect. Not seeming to recognize family members (or other pets) or becoming stressed under “normal” conditions may indicate senior dementia as well. This type of behavior is also a product of pain, so care should be taken to rule out arthritis, injury, or other potential causes. Cats suffering from senile dementia may “forget” to eat. Like the litter box, this is another sign that you should see the vet about because it can be linked to a serious health issue. Additionally, cats that go without food for too long are susceptible to hepatic lipidosis. There are many reasons why a cat would have a decrease in appetite or stop eating altogether. This is something that needs to be investigated as soon as possible for cats of any age, especially seniors. The treatment of senile dementia in cats is not used to reverse the situation, because unfortunately this is not possible and neurological damage from old age cannot be reversed in any way. Drug treatment in these cases is intended to stop the loss of cognition and prevent it from getting worse. A drug containing the active ingredient selegiline is used, but this does not imply that it is suitable for all cats, in fact, only the vet can assess in each case whether it is necessary to implement pharmacotherapy. Keep a log of the changes in behavior that you have noticed, including the timeframe and how often you notice each. Make an appointment with your veterinarian to discuss your observations. Keep in mind that the first step for any behavior problem is to rule out any medical causes first. For example, if your cat is urinating out of the box and never did this before, your vet will want to rule out urinary problems before addressing senior dementia changes. There are many steps you can take that can help your cat, including diet changes and nutritional supplements. Sticking to routines and ensuring he stays active and engaged can also do wonders for reducing confusion and maintaining brain function. Reserve a room where your cat can relax at all times when you have visitors, as excessive stimulation in their environment isn’t good for them. Do not move its accessories. If they go outside, supervise them and when they re-enter make sure their space is left in the same way, so you won’t disorient them. Place some ramps down if your cat cannot access the usual places where they like to spend their time.